Whether you’re primarily watching for the commercials, patiently waiting for the halftime show, or here for the football, Sunday is a day filled with food, friends, and football. As the token vegan in my group, I know the struggle of going to a super bowl party and seeing little to no healthy options that fit into my diet. Note to self: chips and carrots do not equal a full, well-rounded meal. Here are a couple plant-based version of fan-favorite dishes to help you stay mindful of what’s on your plate while satisfying your taste buds! Preheat the oven to 450° and line a baking sheet with parchment paper–this is important or the cauliflower will stick to the baking sheet. Add the dry ingredients (flour, salt, pepper and spices) into a large mixing bowl and evenly mix before adding the water and almond mylk. Whisk together. The batter’s consistency needs to be thick enough for it to stick to the cauliflower, but not too thick or else it will not be pourable. If the batter is on too liquidy, add more flour. If the batter is too thick, add a bit more water and mix until the consistency is right. Wash the cauliflower and remove the stem before chopping the cauliflower. The easiest way is to cut along the “branches” and chop them into bite-size pieces. 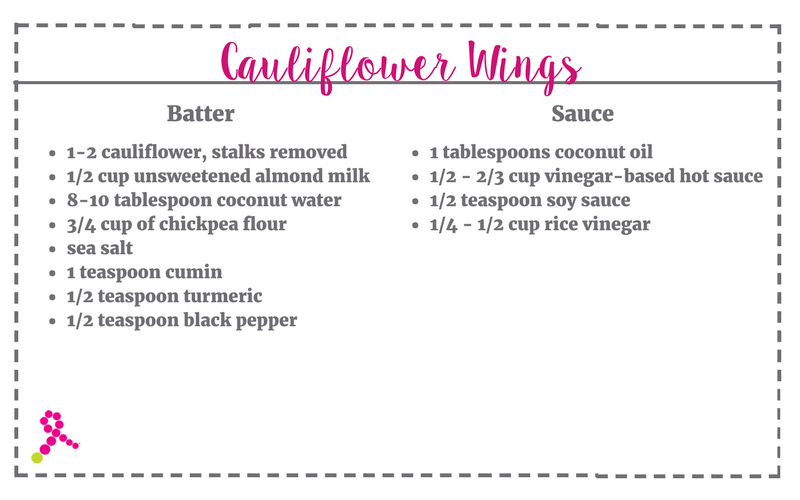 Toss the cauliflower pieces in the batter and make sure each “wing” is fully covered. Place on baking sheet and space out so they do not bake on top of each other. An optional step is dipping the cauliflower wings in breadcrumbs before placing on the baking sheet–I forgot to add breadcrumbs to my list so I skipped this step. While the cauliflower wings are baking, prepare the sauce. Place the coconut oil in a small mixing bowl. If the coconut oil is solid, heat up until completely liquid. Add the rest of ingredients and whisk together. When the cauliflower is done, take out of oven and place back into the large mixing bowl. Pour the sauce over the cauliflower and toss until all of the wings are covered. Place back on baking sheet and bake for another 5-15 minutes. Serve immediately with vegan ranch dressing or let cool. This dish tastes get the next day too—yay #leftovers! Depending on what your preference you can use the vegan queso as the cheesy topping, but prefer to use shredded vegan cheese by Follow Your Heart. Another option if you’re short on time and energy is cheesy sauce by Heidi. Preheat the oven to 400°-450°, and prepare a baking sheet with parchment paper. The beauty of this recipe is you can customize your nacho by layering your favorite ingredients. The key to creating the best nachos is layering bit by bit because this will allow all of the cheese to melt. Lay out a layer of chips and sprinkle cheese on top. Place in oven until the cheese is melted, about 5-10 minutes. Pull out the baking sheet and layer on more chips and cheese, and add black beans, mushrooms, tomatoes, and protein chunks. Put back in oven for another 5-10 minutes until the cheese melts. Repeat this step and add tomatoes, peppers, mushrooms, black beans and extra cheese. 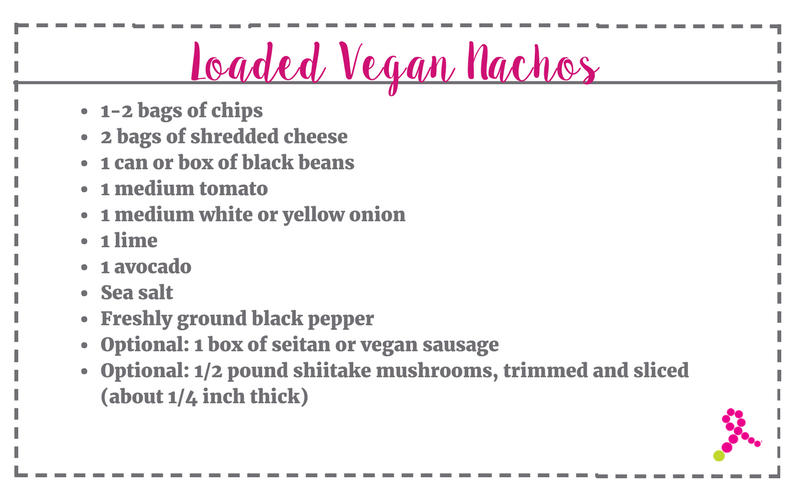 Continue layering chips and ingredients until you’re happy with your nachos. Add guacamole on top or serve on the side. For the optional shiitake bacon topping and other healthy recipe ideas check out our plant-based holiday dishes. This recipe is one of my go-to winter recipes and inspired by a Chef Chloe recipe. Depending on your spicy preference, you can customize the recipe. If you like spicer, you can replace the bell peppers with poblano peppers. If you don’t like spicy, switch out the poblano peppers for all bell peppers. Place peppers on a baking sheet. Roast for 25 minutes, and turn once after 10-15 minutes. The peppers’ skins will be bubbling and blackened. After roasting, place peppers in a bowl and wait for them to cool. Once cool, deseed, peel and coarsely chop the peppers. 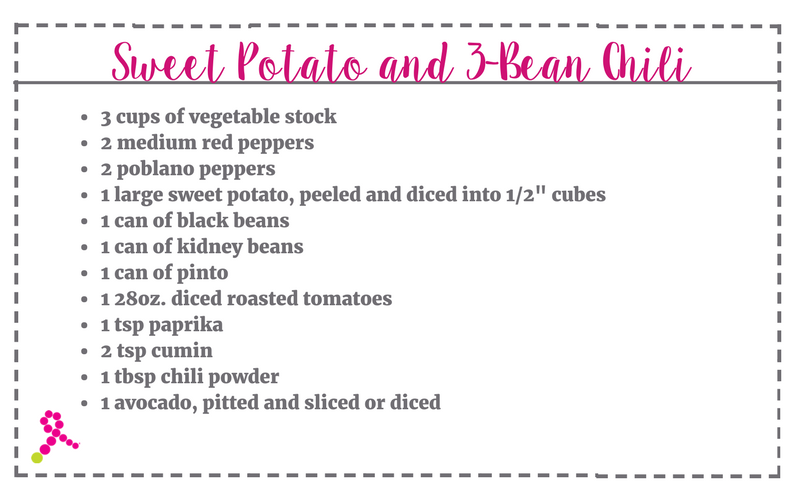 I recently got an Instant Pot and converted this recipe, but I’ll include the original recipe’s instructions. Another aspect that I changed up was the spices. I love getting creative and trying out new spice combinations and don’t necessarily go by exact measurements, but for this recipe I did my best to measure out and report what I used. For an instant pot: Turn on the instant pot to sauté. Heat up 2 tablespoons of olive oil before adding onions and garlic salt. Cook for about 4 minutes until the the onions are translucent. Add sweet potatoes and cook for 5 minutes before adding garlic and peppers. Cook for 2 minutes before adding the veggie stock beans, tomatoes and rest of the spices. Set the instant pot to high pressure and cook for 10 minutes. When complete, allow the instant pot to depressurize naturally—aka natural release. For cooking in a large pot, you’ll heat 2 tablespoons of olive oil over medium-hight heat before adding the onions and garlic salt—or chili powder. Cook for 4 minutes before adding the sweet potatoes and saute for an additional 5 minutes. Add garlic and chopped peppers and cook over medium-high heat for 2-4 minutes. Add the veggie stock, beans, tomatoes, spices and salt. Bring the mixture to a boil and then simmer for 30-45 minutes, lightly covered. Stir occasionally and partially cover the chili. Slice a quarter or a half of an avocado and enjoy immediately. You can also store in the fridge and enjoy up to three days after cooking. Another great option is freezing batches and reheat when you want to enjoy at a later date! Perfect for an extra cold night! I found this recipe for vegan queso. My fridge space was limited so this queso recipe by ended up here. This recipe is a great option if you like cheesy nachos. Plus what is a football party without a cheesy dip! We’re thrilled to have Julie Lanford, Kim Rose, Emilie Robinson on February 24, 2018 speak at the General Session on Nutrition and Fitness at the 2018 YSC National Summit in Orlando, FL. 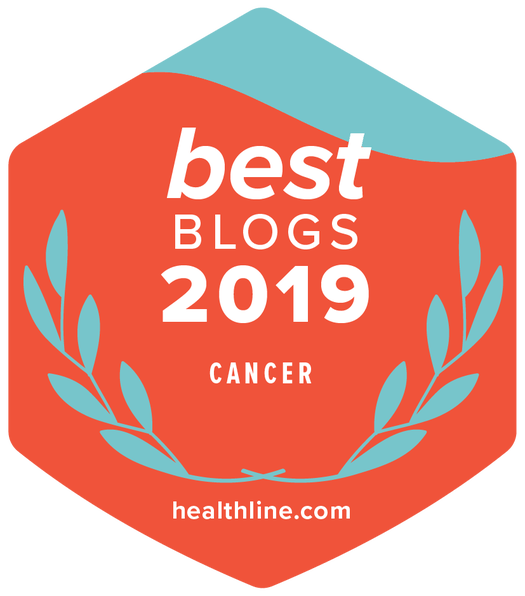 Learn more about the workshops and other sessions that address the unique issues that young women face after a breast cancer diagnosis. Register now and don’t forget to book your hotel room before February 1st to lock in the best rate.